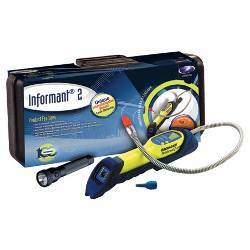 Bacharach Informant 2 Leak Detector Deluxe Kit for Refrigerants. Quick Change Sensors. Audible Indicator. Dual LED Displays. Comes with color-coded probe tips, protective rubber boot, flashlight, instruction manual, 6 AA batteries, 5 filters and a hard carrying case. CE Mark and UL Approved for Class 1, Div 1 Group D.
The Informant ® 2 is the only dual-purpose leak detector for detecting both combustible and refrigerant gases and is ideal for residential and commercial heating and cooling contractors. 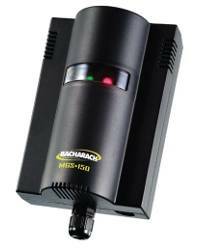 Its unique combination of state-of-the-art sensor technology, advanced software design and microprocessor-controlled circuitry offers unmatched accuracy and detection speed. The Informant ® 2 utilizes patented semiconductor sensor technology to detect combustible gases and a patented heated diode sensor technology to detect refrigerants. Easily switch sensor tips in just a few seconds with no need to adjust sensitivity levels, - it’s taken care of automatically - even where high levels of background vapors or refrigerants are present. Gaining access to hard to reach areas is easy with the finely tapered sensor tip. 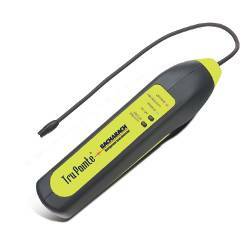 The Informant ® 2 leak detector features an audible indicator with a mute option coupled with sequential LEDs to monitor increasing concentrations of refrigerant or combustible gases. The bar graph display provides visual confirmation of leak concentrations and a flashing light leak rate indicator on the probe tip helps to visually define the sampling location. Sensors (Combustible) Patented semiconductor type. Five year typical life. > LEAK DETECTORS > REFRIGERANTS : 34 Items found. 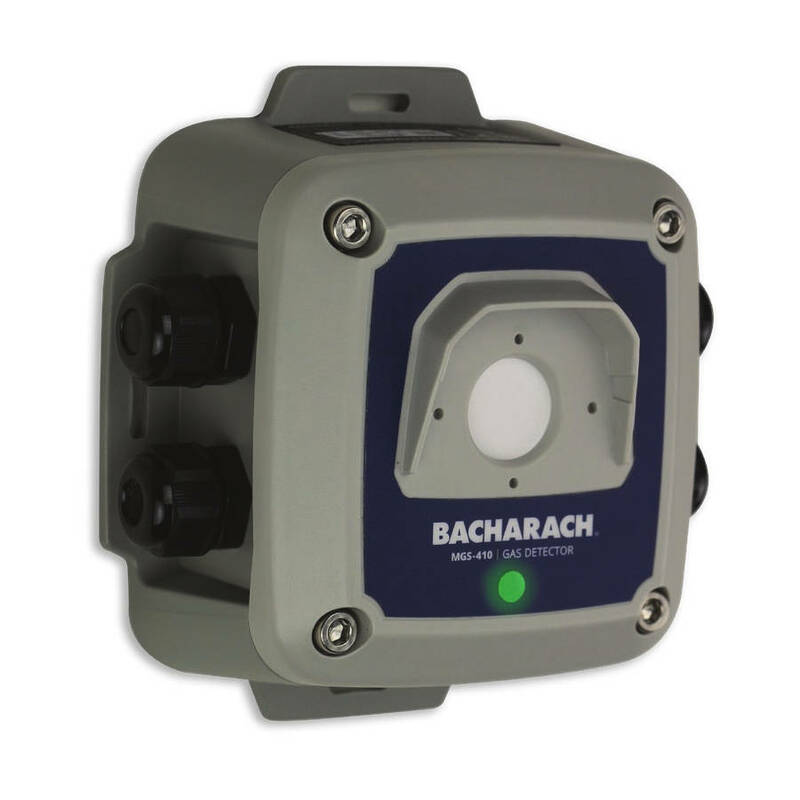 Bacharach MGS-150 Gas Detector Transmitter with semiconductor sensor for Refrigerant Gases (HFC, CFC, HCFC) for Industrial and Commercial Refrigeration. 4-20mA 0-5000ppm, 0-5V, 0-10V, 1-5V or 2-10V user selectable analog outputs. Onboard Alarm LED, audible buzzer and alarm relay. IP41 Housing (IP66 optional) and Remote sensor option. CE, IEC61010, Exd and UL CSA Approvals. Factory configured for either Halocarbon, R134a, R404a, R407a, R410a, R22, R507a or LPG. Bacharach MGS-150 Gas Detector Transmitter with semiconductor sensor for Refrigerant Gases (HFC, CFC, HCFC) for Industrial and Commercial Refrigeration. 4-20mA 0-1000ppm, 0-5V, 0-10V, 1-5V or 2-10V user selectable analog outputs. Onboard Alarm LED, audible buzzer and alarm relay. IP41 Housing (IP66 optional) and Remote sensor option. CE, IEC61010, Exd and UL CSA Approvals. Factory configured for either R134a, R404a, R407a, R410a, R434a, R22, R507a, R600a, R290, R123, R407c, R11, R407f, R23 or R-1234ze. Bacharach MGS-410 Gas Detector Transmitter with electrochemical sensor for Refrigerant Gases (HFC, CFC, HCFC) 0-1000ppm measurement in Refrigeration Applications. RS485 MODBUS RTU output, audible & visual alarms. IP66 Housing. CE, UL and CSA Approvals. Factory configured for either R134A, R404A, R407A, R410A, R22, R507A, R407C, R407f, R-1234ze, R32, R448A, R452A, R513A, R434A, R450A, R1234yf, R514A, R452B, R454A, R422, R422D, R427A, R449A or R454C. Bacharach MGS-410 Gas Detector Transmitter with semiconductor sensor for Refrigerant Gases (HFC, CFC, HCFC) 0-5000ppm measurement in Refrigeration Applications. RS485 MODBUS RTU output, audible & visual alarms. IP66 Housing. CE, UL and CSA Approvals. Factory configured for either R600A, R290, R600 or HC12a. 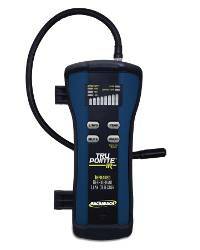 Bacharach Tru Pointe Portable Refrigerant Leak Detector for All CFC, HCFC and HFC Refrigerants. Battery Powered. User-selectable low or high sensitivy mode. Audible and visual indicators. CE Mark approved. Bacharach MGS-450 Gas Detector Transmitter with semiconductor sensor for Refrigerant Gases (HFC, CFC, HCFC) 0-5000ppm measurement in Refrigeration Applications. 3 x relays (low, high & fault), analog output (4 to 20 mA, 0 to 5 V, 0 to 10 V, 1 to 5 V, 2 to 10 V), RS485 MODBUS RTU output, audible & visual alarms. IP41 or IP66 Housing. CE, UL and CSA Approvals. Factory configured for either R600A, R290, R600 or HC12a. Bacharach MGS-450 Gas Detector Transmitter with electrochemical sensor for Refrigerant Gases (HFC, CFC, HCFC) 0-1000ppm measurement in Refrigeration Applications. 3 x relays (low, high & fault), analog output (4 to 20 mA, 0 to 5 V, 0 to 10 V, 1 to 5 V, 2 to 10 V), RS485 MODBUS RTU output, audible & visual alarms. IP41 or IP66 Housing. CE, UL and CSA Approvals. Factory configured for either R134A, R404A, R407A, R410A, R22, R507A, R407C, R407f, R-1234ze, R32, R448A, R452A, R513A, R434A, R450A, R1234yf, R514A, R452B, R454A, R422, R422D, R427A, R449A or R454C. 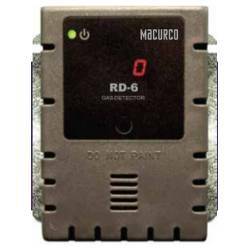 MACURCO RD-6 line voltage Refrigerant (REF) 0-1000 ppm Gas Detector controller and transducer for R-22, R-134A, R-404A, R-407C and R-410A. Selectable 4-20mA output, buzzer, alarm and fan relays with digital display. 12 to 24 VAC or 12 to 32 VDC. ETL Listed to UL 61010-1. Long life solid state sensor. 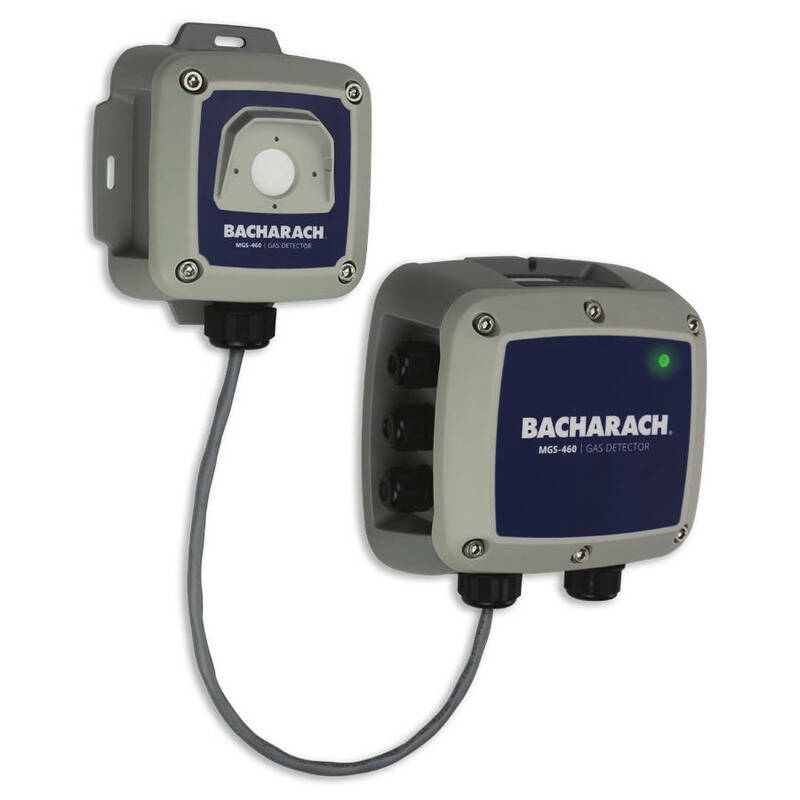 Bacharach MGS-460 Gas Detector Transmitter with remote (5m) electrochemical sensor for Refrigerant Gases (HFC, CFC, HCFC) 0-1000ppm measurement in Refrigeration Applications. 3 x relays (low, high & fault), analog output (4 to 20 mA, 0 to 5 V, 0 to 10 V, 1 to 5 V, 2 to 10 V), RS485 MODBUS RTU output, audible & visual alarms. IP66 Housing. CE, UL and CSA Approvals. Factory configured for either R134A, R404A, R407A, R410A, R22, R507A, R407C, R407f, R-1234ze, R32, R448A, R452A, R513A, R434A, R450A, R1234yf, R514A, R452B, R454A, R422, R422D, R427A, R449A or R454C. Bacharach MGS-460 Gas Detector Transmitter with remote (5m) semiconductor sensor for Refrigerant Gases (HFC, CFC, HCFC) 0-5000ppm measurement in Refrigeration Applications. 3 x relays (low, high & fault), analog output (4 to 20 mA, 0 to 5 V, 0 to 10 V, 1 to 5 V, 2 to 10 V), RS485 MODBUS RTU output, audible & visual alarms. IP66 Housing. CE, UL and CSA Approvals. Factory configured for either R600A, R290, R600 or HC12a. MACURCO RD-12 line voltage Gas Detector, controller and transducer for Refrigerants (REF) 0-1,000ppm including R-22, R-134A, R-404A, R-407C and R-410A. Selectable 4-20mA output, buzzer, alarm and fan relays with digital display. 100 to 240 VAC 50-60Hz power. ETL Listed to UL 61010-1. Long life solid state sensor. 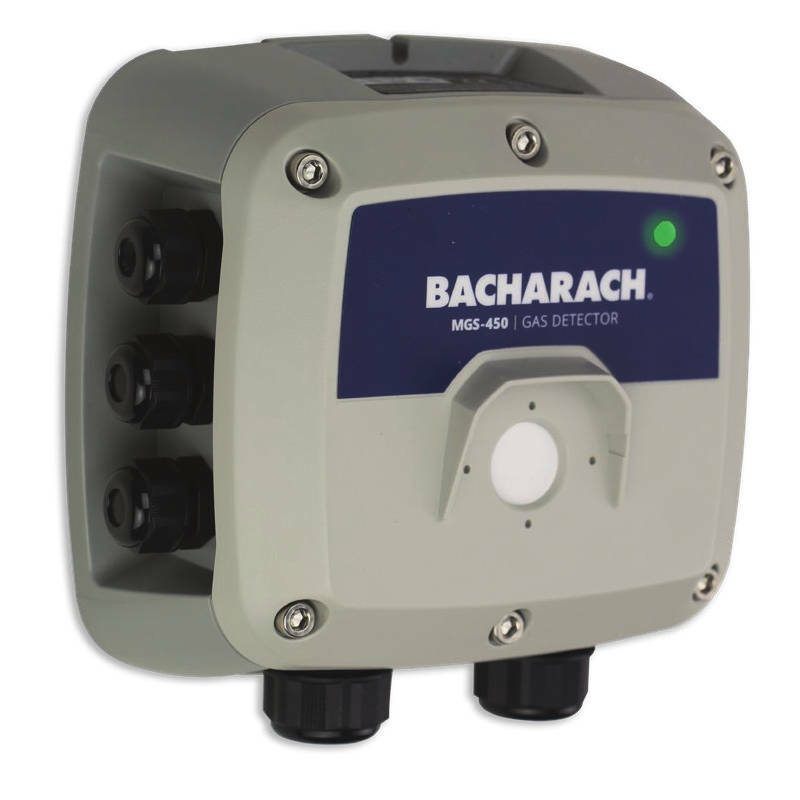 Bacharach Informant 2 Leak Detector Kit for Refrigerants. Quick Change Sensors. Audible Indicator. Dual LED Displays. Comes with color-coded probe tips, instruction manual, 4 AA batteries, 5 filters and a soft carrying case. CE Mark and UL Approved for Class 1, Div 1 Group D.
Bacharach Tru Pointe IR Infrared Refrigerant Leak Detector for CFC, HCFC, HFC and HFO-1234yf refrigerants. Compact Size. LED bar graph. Visual and audible alarms. Rechargeable lithium ion battery. Rugged housing. SAE J1627, SAE J2791, SAE J2913, CE (pending) and EN 14624 Approvals. 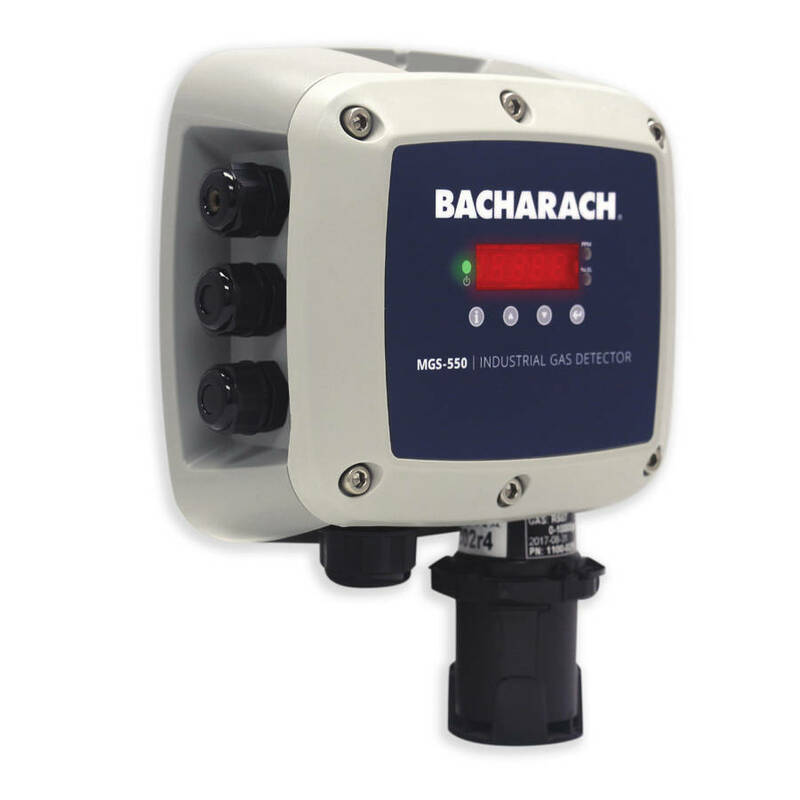 Bacharach MGS-410 Gas Detector Transmitter with catalytic sensor for Refrigerant Gases (HFC, CFC, HCFC) 0-100% LEL measurement in Refrigeration Applications. RS485 MODBUS RTU output, audible & visual alarms. IP66 Housing. CE, UL and CSA Approvals. Factory configured for either R600 or R290. Bacharach MGS-550 Industrial Refrigerant Gas Detector with semiconductor sensor for Refrigerant Gases (HFC, CFC, HCFC) 0-1000ppm or 0-5000ppm. 3 x relays, analog output, RS485 MODBUS output and 5-digit display. Remote sensor capabilities. IP66 Housing. CE, UL and CSA Approvals. Factory configured for either R32, R134A, R404A, R407A, R407C, R407F, R410A, R422A, R422D, R427A, R507, HFO1234YF, HFO1234ZE, R290, R600, R448A, R449A, R452A, R513A. Bacharach MGS-550 Industrial Refrigerant Gas Detector with semiconductor sensor for Refrigerant Gases (HFC, CFC, HCFC) 0-10000ppm. 3 x relays, analog output, RS485 MODBUS output and 5-digit display. Remote sensor capabilities. IP66 Housing. CE, UL and CSA Approvals. Factory configured for either R32, R134A, R404A, R407A, R407C, R407F, R410A, R422A, R422D, R507, HFO1234ZE. Bacharach MGS-450 Gas Detector Transmitter with catalytic sensor for Refrigerant Gases (HFC, CFC, HCFC) 0-100% LEL measurement in Refrigeration Applications. 3 x relays (low, high & fault), analog output (4 to 20 mA, 0 to 5 V, 0 to 10 V, 1 to 5 V, 2 to 10 V), RS485 MODBUS RTU output, audible & visual alarms. IP41 or IP66 Housing. CE, UL and CSA Approvals. Factory configured for either R600 or R290. 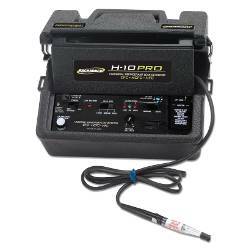 Bacharach H-10 Pro Universal Refrigerant Leak Detector for all halogen-based, non-flammable CFC, HFC and HCFC regrigerants. Ultra-sensitive detection. Rechargeable battery. LED and audible buzzer indicators. CE Mark Approved.